Furthermore, there appears to be some very bad blood between the USA and the Erdogan regime. Things got so bad that Erdogan’s chief adviser, Seref Malkoc, said that Turkey might deny the US the use of Incirlik Air Base for strikes against ISIL if the US does not name the YPG as a terrorist group. Erdogan later repudiated this statement, but the fact remains that the Turks are now directly blackmailing the USA. If Erdogan and his advisors seriously believe that they can publicly blackmail a superpower like the USA then their days are numbered. At the very least, this kind of irresponsible outbursts shows that the Turks are really crumbling under the pressure they themselves have created. At least one reporter, Robert Perry, as written the following: “A source close to Russian President Vladimir Putin told me that the Russians have warned Turkish President Recep Tayyip Erdogan that Moscow is prepared to use tactical nuclear weapons if necessary to save their troops in the face of a Turkish-Saudi onslaught”. Is that really possible? Would the Russians really use nuclear weapons of things get ugly in Syria? There is no ambiguity here. Unless Russia is threatened as a state she will not use nuclear weapons. Some will, no doubt, say that the official military doctrine is one thing, but the reality in Syria is another one and if the Turks overrun Khmeimin Russia will have no other option than to use nukes. There is a precedent for that kind of logic: when the US deployed the 82nd Airborne in Saudi Arabia as part of Desert Shield the Pentagon fully understood that if the much larger Iraqi army invaded Saudi Arabia the 82nd would be destroyed. It was hoped that the USAF and USN could provide enough air sorties to stop the Iraqi advance, but if not it was understood that tactical nuclear weapons would be used. The situation in Syria is different. For one thing, the Russian task force in Syria is not an infantry tripwire force like the 82nd in Iraq. The terrain and the opposing forces are also very different. Second, the Russian contingent in Syria can count on the firepower and support of the Russian Navy in the Caspian and Mediterranean and the Russian Aerospace Forces from Russia proper. Last but not least, the Russians can count in the support of the Syrian military, Iranian forces, Hezbollah and, probably, t he Syrian Kurds who are now openly joing the 4+1 alliance (Russia, Iran, Iraq, Syria and Hezbollah) turning it into a 4+2 alliance I suppose. Of course! The Ukronazis fit this picture perfectly. 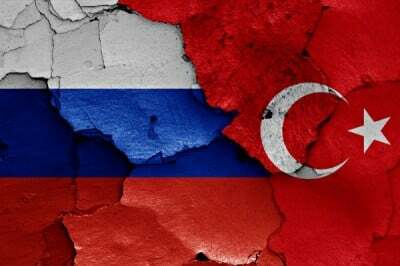 Well, guess what, they are dreaming of forming an anti-Russian alliance with the Turks now. Amazing no? Just imagine what a Ukrainian-Turkish-Saudi alliance would look like: a real life “Islamo-Fascist” gang of thugs combining hateful fanaticism, corruption, incompetence, violence, strident nationalism and military incompetence. A toxic combination for sure, but not a viable one.